We seek to engage and empower children especially, the vulnerable in society and to provide meaningful interventions in areas of education, health, Water and sanitation, and Livelihoods. This will be done through partnership and with volunteers. 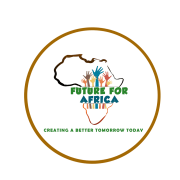 Future for Africa will endeavor to influence policies and actions at all levels of society towards inspiring hope in the younger generations of society and also to promote intercultural awareness, tolerance among the youth. Future for Africa offers a blend of programmes and services for children and young people. It aims to enhance the quality of life through a structured intervention and advocacy programme that offers opportunities for children and young people’s development. Work: programs can include life skills and basic education, job training and placement, entrepreneurship, and other youth - friendly services targeting disadvantaged children, young people, including orphans and vulnerable children. We seek to engage and empower children especially, the vulnerable in society and to provide meaningful interventions in areas of education, health, Water and sanitation, and Livelihoods. Our services include volunteer, intern and travel programs,our programs are year round, and are designed to help both participants and our target group in the delivery of our service. Would you recommend FUTURE FOR AFRICA?